Facebook has assisted in nonprofit growth since its founding in 2004, yet recently it has released a new version of its website directly tailored towards nonprofit organizations. Facebook’s new site, called “Facebook for Nonprofits” has the potential to completely change the way we interact with non-governmental organizations over social media. This new page seeks to help organizations get started, raise awareness of their organization, maintain contact with supporters and gain funding. Principally, it demonstrates how to create a Facebook page and increase your audience. Nevertheless, this new website also shows how NGOs can use different tools on this social network, such as soliciting donations for your nonprofit. Facebook is known for its effective fundraising campaigns which are able to access the millions of people who check Facebook daily. Frequently, those who are passionate about an issue are unsure of how to most effectively be proactive about it. Facebook urges nonprofits to be active in maintaining their online presence as doing so can be extremely useful. Creating an online community can get the ball rolling and build momentum and interest for your nonprofit. Facebook tools such as its event organizer and group messages allow those interested to unite for a common cause. 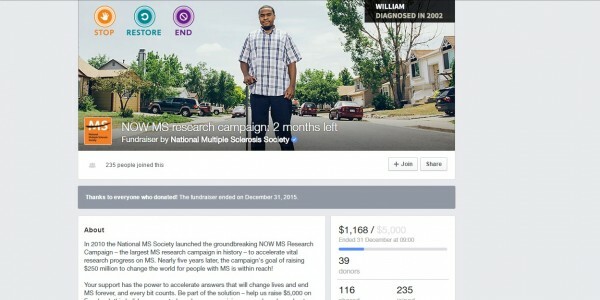 A good example of a fundraising campagin made in Facebook would be the case of the National Multiple Sclerosis Society, that could reach over 1,168$. Below we attach a screenshot that shows its impact.